Sea buckthorn is known as a panacea, or cure-all, in many parts of Eastern Asia and Russia. It’s been used for thousands of years to treat all sorts of health issues and illnesses. With modern science and the history of trial and error that made sea buckthorn popular in the first place, we’re now uncovering the true health benefits of this super fruit. Sea buckthorn has an impressive nutritional profile that indirectly heals and fortifies the entire body. With 14 essential vitamins, omega’s 3, 6, 9, the rare omega 7, super charged anti oxidants, hundreds of other nutrients, and anti-inflammation properties; Sea buckthorn is THE supplement to be taking. It’s as if one combined fish oil with a multi vitamin/mineral all from one fruit. To make matters better, this is vegan friendly. It’s just a fruit with almost everything the body needs! For direct healing, sea buckthorn is effective on the skin for burns, wounds, cuts, and any kind of skin damage. It’s a true skin healer and the high levels of omega-7, mostly found in the berry oil, are reknown for supporting tissue and mucous membranes. It’s widely used, and probably best known, as a beauty berry. Daily use can keep you young and healthy from the inside-out, nourishing the skin and body tissues. The oil is commonly taken internally to deal with ulcers and other inflammation issues such as in the throat or skin. This is only scratching the surface. Sea buckthorn is here to stay and the ways to use it are becoming increasingly clear as individuals share their success stories and modern science continues it’s research. 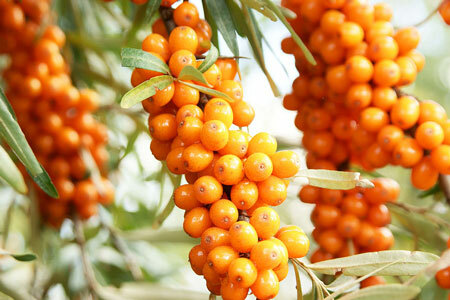 The health benefits of sea buckthorn are becoming very clear and the world is taking notice. Sea Buckthorn: An East-Asian Panacea? Sea Buckthorn: The True Healing Oil for Tissue Regeneration! Sea Buckthorn Oil Is A Natural Remedy for Yeast Infections! Is Sea Buckthorn Oil the All-Natural Psoriasis Remedy You’ve Been Waiting For? Can Sea Buckthorn Help Prevent Heart Disease? Sea Buckthorn: An All-Natural Inflammation Fighter?